Find out how strong patents and pricing power set this chip supplier apart from the competition. One of the key ways to find a winning investment is to seek out a company with pricing power. The ability to charge a premium price for one's products can lead to higher profit margins -- and in many cases, a higher stock price. Ambarella (NASDAQ:AMBA) consistently delivers quarterly gross profit margins in the mid-60% range. Here's how the chip supplier does it. Approximately 72% of Ambarella's 658 employees are classified as research and development (R&D) personnel. These employees are essential to the creation of semiconductor systems-on-a-chip (SoCs) that the company uses to dominate the high-definition video processing marketplace. Customers utilize Ambarella's SoCs in various applications, including action cams, wearable body cameras, IP security, automobile dashboard cameras, and drones. Ambarella chips are unique in that they have properties the competition has been unable to match. This allows the company to be a single-source supplier to its customers. Key features such as low power consumption or the ability to operate in low ambient light conditions give Ambarella products a price premium as well. Customers then turn these features into advantages for products they sell to end users and similarly charge a higher price for superior performance. Looking at Ambarella's patent activity is a clue to its success. Below is a table showing the number of patents granted to the company by year. Data source: PatentBuddy. Chart by author. These patents create a moat around some of the exclusive designs that power the key advantages Ambarella products offer to customers. When we compare Ambarella to other semiconductor companies, its 66% non-GAAP gross margin stands out from the crowd -- yet another sign of the pricing power it can enjoy due to the irreplaceable nature of its technology. InvenSense has 632 employees, of which 311 are in R&D. It operates in more of a commodity-type business, thus having to compete on price to win design sockets in customer applications. 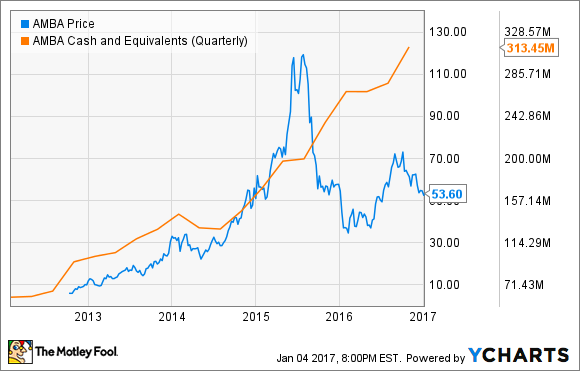 As a result, InvenSense has a much lower gross margin for the products it sells. Although both companies are fabless semiconductor companies, one clearly provides a unique product that is more profitable than the other. A company such as Ambarella forms deep ties with its customers, helping fulfill design needs for future products. Evidence of the partnering is reflected in comments from last quarter's earnings report stating that -- although not material of late -- Ambarella engages in margin-sharing arrangements with one or more of its customers predicated on the customer's product margin where the SoCs are used. In other words, Ambarella can get more money if its customer sells the final product to end users at a higher price. This may happen when the customer believes they can charge more for a product based on any competitive advantages offered by Ambarella's chips. From an investor's perspective, when we find a company with pricing power, it can be wise to invest and allow time to be your friend. Although Ambarella's stock price has been volatile at times, it continues to add cash to its balance sheet on a quarterly basis, and in the long-term may well wind up rewarding the patient investor. All too often we tend to sell too early in a company's life cycle, failing to let the story play out. As long as Ambarella can outperform competitors with its chips, the company will continue to dominate its space, and that should mean more cash pouring onto the balance sheet. 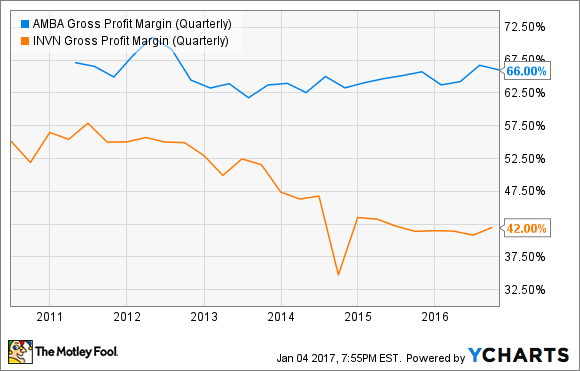 Just keep your eye on gross margins staying in the mid-60% range and watch for cash flows to remain strong.